Manage and track all aspects of EH&S workplace safety including employee working locations, history, training requirements, incidents, accidents, causes, and the necessary corrective actions. Define the employee's workplace location and responsibilities. Monitor, track and report workplace incidents and accidents with corrective actions. Create and report OSHA accident notifications and annual accident reports. Customizable inspection questionnaires, document and photograph difficiencies, automated corrective actions. Track training requirements and training frequency requirements with alerts and notifications. Monitor, track and report worker and workplace industrial hygiene results. AdHoc reporting system allows creating custom reports with virtually unlimited capabilities. Perform audits and inspections using our iOS mobile app for better mobility. Chemical Safety’s EMS employee workplace safety software supports the organizations needs as they relate to managing and tracking all aspects of environmental health and safety employee and workplace safety. It tracks employee working locations, history, and cross-references training requirements with target dates for re-training. This module records and reports workplace incidents, accidents, causes, and the necessary corrective actions. Accidents are sometimes indicators of areas where safety improvements can be made. EMS software will help you identify the root cause of reported accidents, discover potential workplace hazards, identify past trends, and establish focused interventions that will prevent similar accidents from recurring. Oversights in matters pertaining to workplace safety can be costly to your company in many ways. The investments of time and money that you make now will pale in comparison to the cost of an accident down the road. Fortunately, this software makes it easy for companies to be proactive about workplace safety and truly do the most they can to protect their personnel. The EMS Tracking module manages detailed information about an employee including history, responsibilities, accident data, training requirements and status. EMS has an intuitive tool that manages employee training requirements by job function, equipment used and training frequency requirements. By connecting specific job responsibilities to training requirements, employers and supervisors can have instant access to employees upcoming training or retraining needs through reports and automated email notifications. The EMS- Accident / Incident module is a cost-effective and easy to use tool that can help you effectively protect the safety, health, and welfare of people engaged in your work or employment. This module will also facilitate compliance with OSHA standards. You can review previous or report new actionable incidents and keep a record in order to avoid unplanned events that adversely affect completion of your company’s operations. 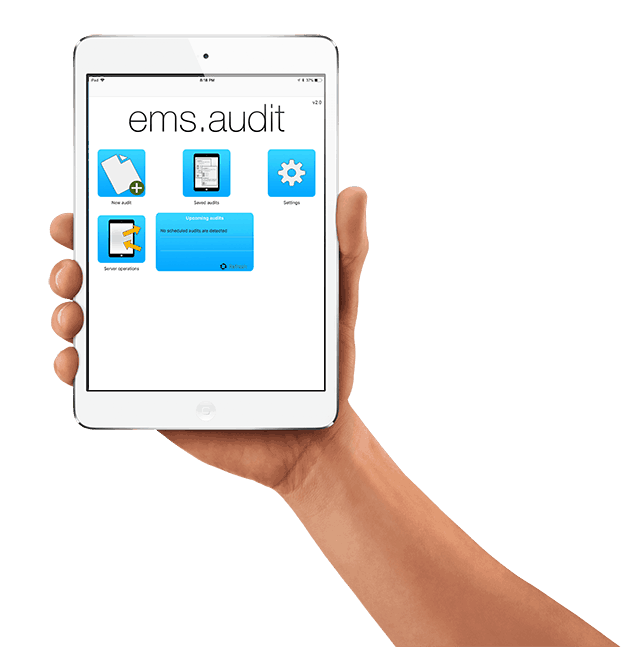 Use the EMS audit module in order to identify possible causes of the incidents recorded. Organize, initiate and apply corrective actions through the EMS task scheduler and calendar module that allow you to stay on top of safety-related events. The EMS Employee Tracking module allows companies to easily and accurately track incidents and accidents that are OSHA reportable. You can quickly and easily report accidents to the Occupational Safety and Health Administration (OSHA), as required, as well as tabulate and report the annual OSHA 300 report easily and accurately. The EMS ad hoc reporting system provides on-demand custom reporting. It provides self-service integrated reports that customers can customize without extensive database knowledge. From simple to complex reporting the interface is easy to learn and use. While the reporting has great out of the box functionality, it is also easily edited depending on the users needs.